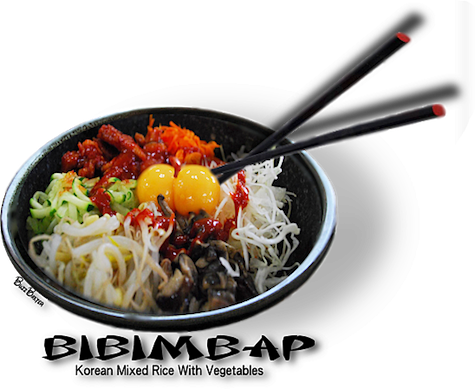 KOREAN BIBIMBAP - A mixture of rice, meats, vegetables, mushrooms and egg. Served with Sriracha chili paste, kimchee and served in a stone bowl. Of the Korean recipes presented here, this is the most definitive of what the cuisine of Korea is about. There is no pretentiousness with ingredients, but just a long history of blending tastes and textures with the senses to make dining an enjoyable experience. 1. Cook rice. You can use a rice cooker or a stainless pot. mix it with 1 clove of minced garlic, sesame oil and a pinch of salt. oil. Put it on the platter. minutes. Add sesame oil. Put it on the platter. and 1 or 2 teaspoon(s) of sugar and stir it for 2 minutes. Add some sesame oil, and put it on the platter. tablespoon(s) of soy sauce, ½ tablespoon(s) of sugar, a little grounded black pepper, and sesame oil. 8. Cut a carrot into strips, sauté for 30 seconds and put it on the platter. 9. Prepare eggs, sunny side up. 11. Serve it with sesame oil and Sriracha hot pepper paste. 12. Lastly, mix it up and eat!